American over-the-top internet television service FuboTV has released a hilarious new spot, part of the “Don’t Compromise” campaign, aimed at encouraging people to not compromise when it comes to cutting cable. 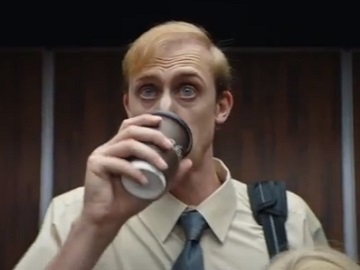 The 30-second spot features Eric, a guy who has always wanted to be a professional basketball player and became, instead, the tallest guy in his office. “Yeah, Eric had to compromise a lot in his life, but not when it comes to cutting the cord. Fubo gives him all the sports he needs, as well as all the shows his family loves,” the voiceover says, while on screen the protagonist is seen having several failed attempts at throwing stuff in the garbage can and, after a long day at the office, watching, on his way out, sports on his smartphone, on Fubo. “Don’t compromise. Get over 100 channels plus Showtime and cloud DVR included,” the voiceover urges viewers at the end of the commercial, directing them to the company’s website. The “Don’t compromise” series also features a father who compromised when it came to the sports car of his dreams, a dog person who compromised on the pet he and his wife are having, and a mother who compromised on the yoga studio she’s always wanted. However, they all have something in common: they did not compromise when it came to cutting the cord. FuboTV focuses primarily on channels that distribute live sports, including NFL, MLB, NBA, MLS and international soccer, plus news, network television series and movies. There are several service options with different channel lineups, including fubo (base package), fubo Extra and add-on packages like fubo Latino and fubo Português. As of September 2018, fuboTV offers live streaming and VOD programming from CBS, FOX, NBC, AMC Networks, TBS, TNT, Cartoon Network, CNN and Showtime.